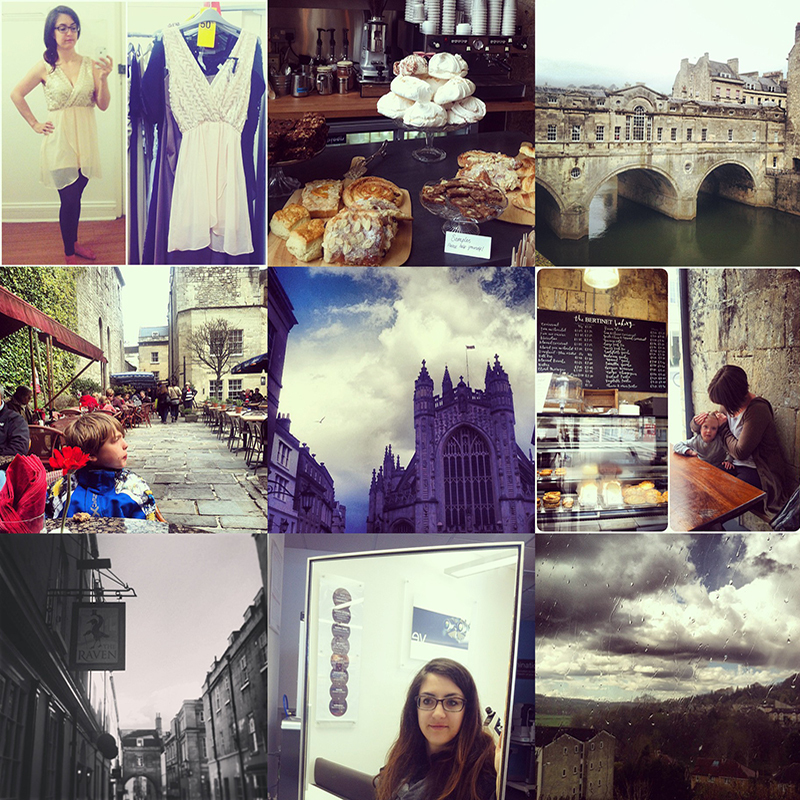 This weekend my husband and I decided to take the family into town where we live in Bath, England. The weather looked like it might become fowl, but with only a few minutes of rainfall we enjoyed both some sun and some cloudy chill skies. There are stil many shops that we have not been into so we ventured into some new places on Saturday. Today has been relatively chill with us staying at home, planning a birthday party for my youngest, and watching the Arsenal game this afternoon. 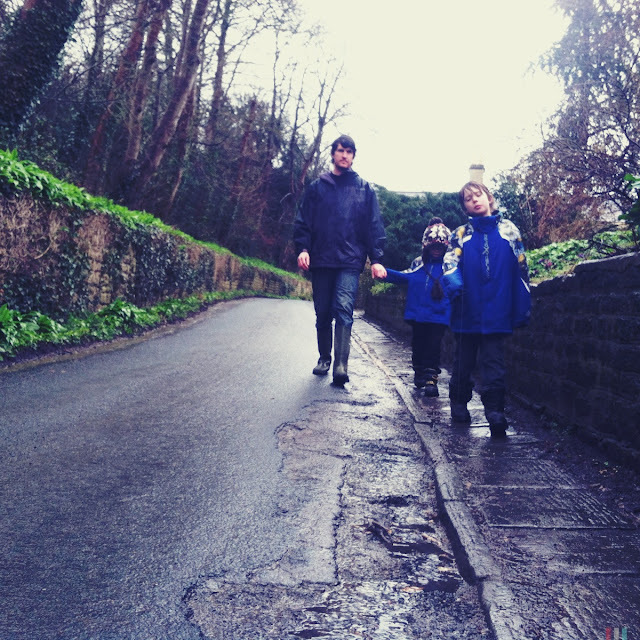 We did miss out on our country walk this week, having opted to go into town instead. This was due to practical matters as well as my eldest is currently without the right shoes for mud. His boots have a gap in the heel and on our last walk he is foot got covered and soaked in muddy water. 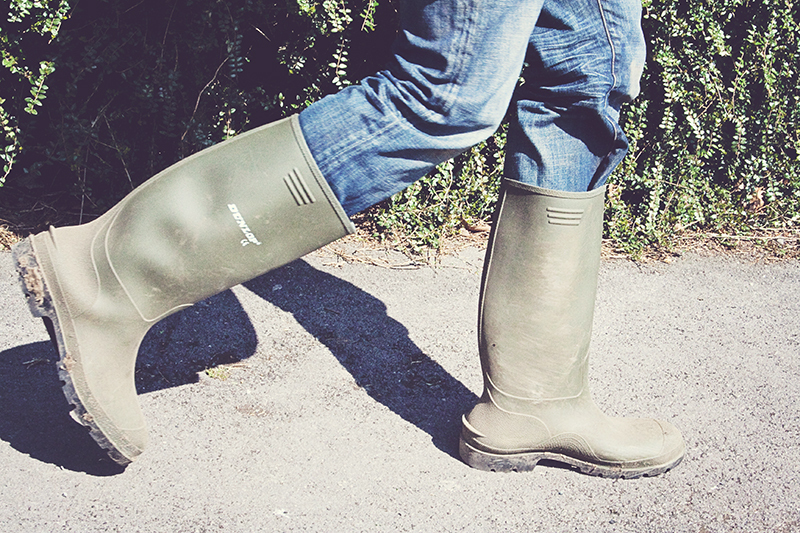 However his replacement wellies are due next week so we can venture out in the countryside on the weekend. Q: How was your weekend? This has been the best weekend so far. I start this post off with quite lofty expectations of what my family and I did these past two days. To be fair we really have not done that much. 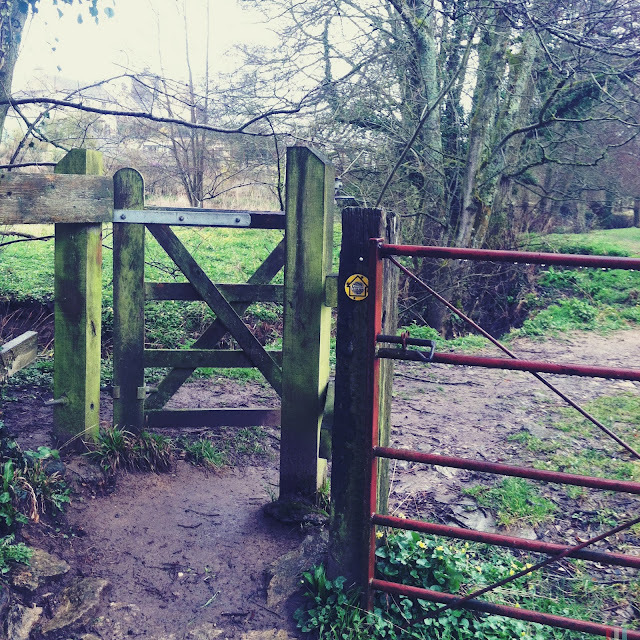 We did leave the house yesterday on our weekly country walk. It was not the most amazing country walk that we have gone on since we moved here at the end of December. There were no celebrity sightings nor did we go visit any museums. I could list off and ramble a good amount of other things that could give reason to why this weekend could have been amazing. I do not need too. This has been the best weekend so far for the pure reason that we were together and we enjoyed every moment. 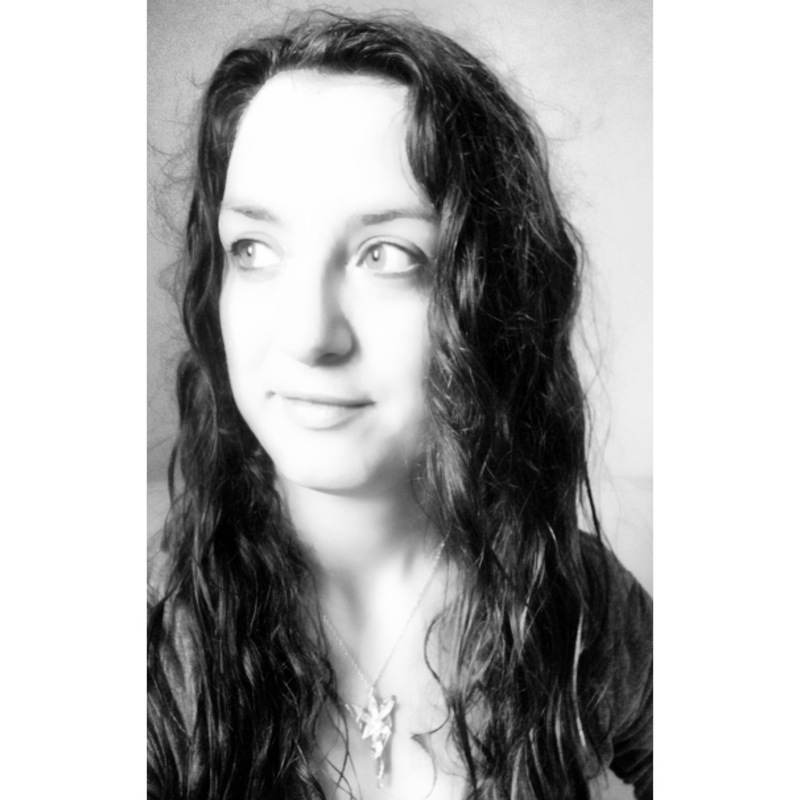 Life has made it apparent to me in recent years of how short it can be. I have also seen how miserable life can be when you cannot share the preciousness with those you love. How you can not get back the time once it has past. This was the best weekend so far because we lived the moment. We enjoyed our country walk and relished over how much we love being outside. We saw a couple of young deer and two wild pheasants. We got to travel through a part of the countryside we have yet to explore. My kids accustomed to our long walks did not complain once this weekend the entire time we were outside and were able to keep up. We had an amazingly warm day where no jackets were needed and we wished we were all wearing a summer wardrobe. Back at home we enjoyed watching the Arsenal football game together cuddled on the couch. Afterwards we realized it was much warmer outside than it was in our home. Ryan got the lawn chairs out and we sat outside drinking wine and talking as a family. 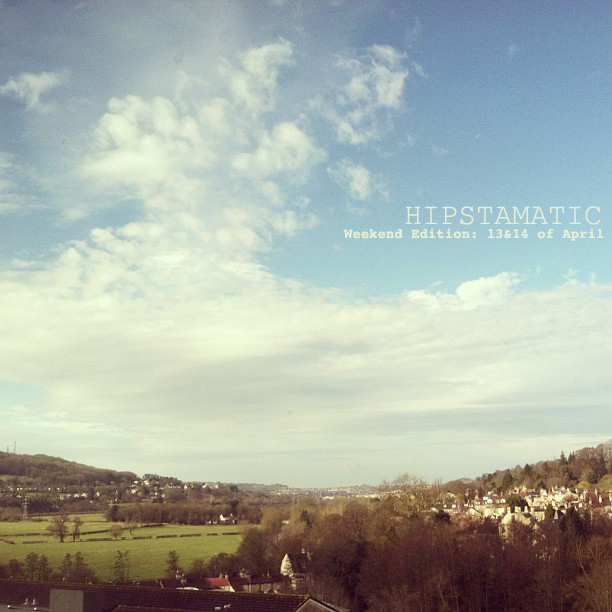 The best part was counting ten different hot air balloons and a hangglider up in the sky from our back garden. It is only midday of Sunday and our weekend continues. I look forward to soaking up every second of it. I hope you are all enjoying every precious moment with the ones that matter most in your life. We started this weekend off with pancakes and our country walk. There was a little debate about whether or not we would be going outside since the weather clearly was ‘rain’ and an Arsenal game would be on in a few hours. 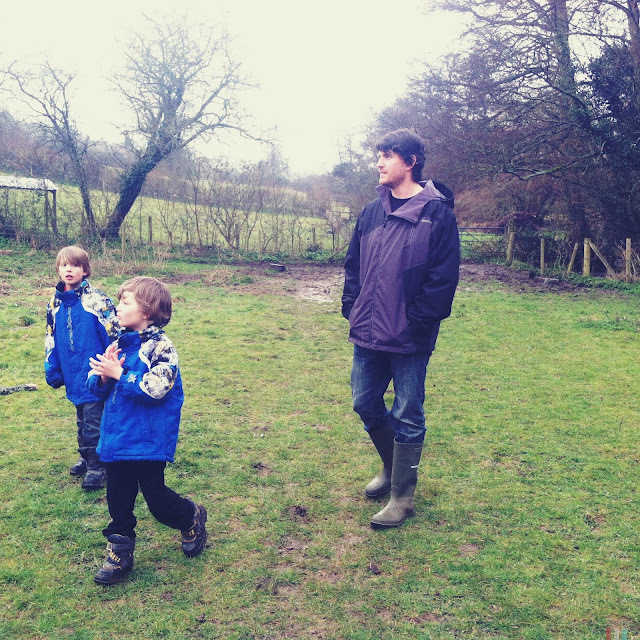 However my need to be outside in the country won over and we got the boys ready for our walk. Every week it is pretty much the same. My sons will complain or find reasons to complain for the first fifteen minutes and then they have an amazing time for the entirety of our journey. 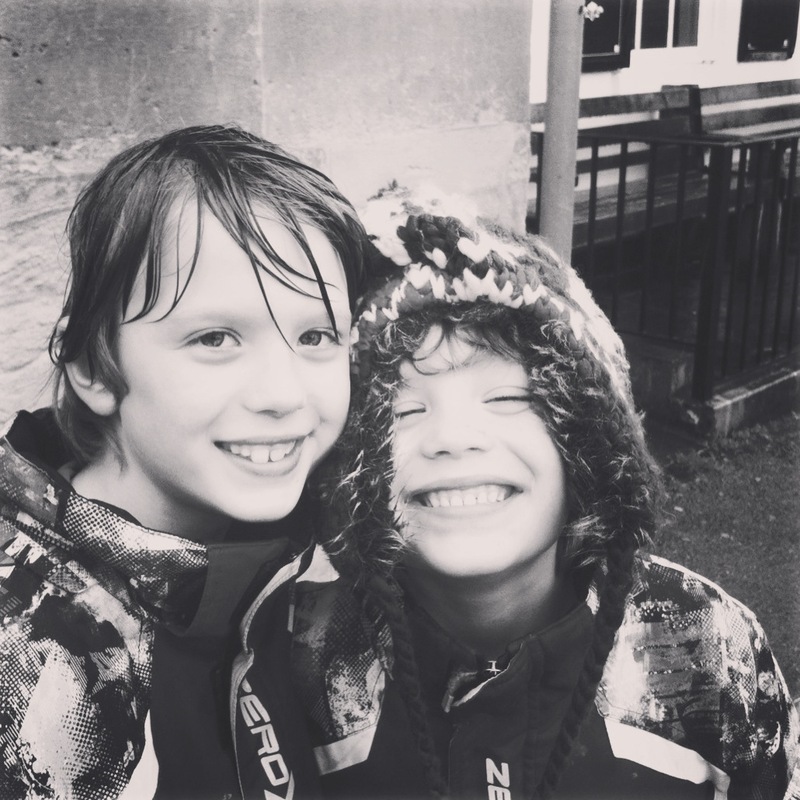 Time seems to stand still when we are outside, hours pass, and my boys just enjoy the moment. I really look forward to my weekends with my family. I had been working in a salon when we first moved to England. 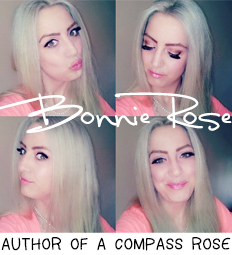 I loved working as a hairstylist but it includes working on the weekends. I was working Saturdays and my husband was working Sundays. Time off for ‘family time’ was seldom and is why I cherish these walks even more. There is always something new to see. 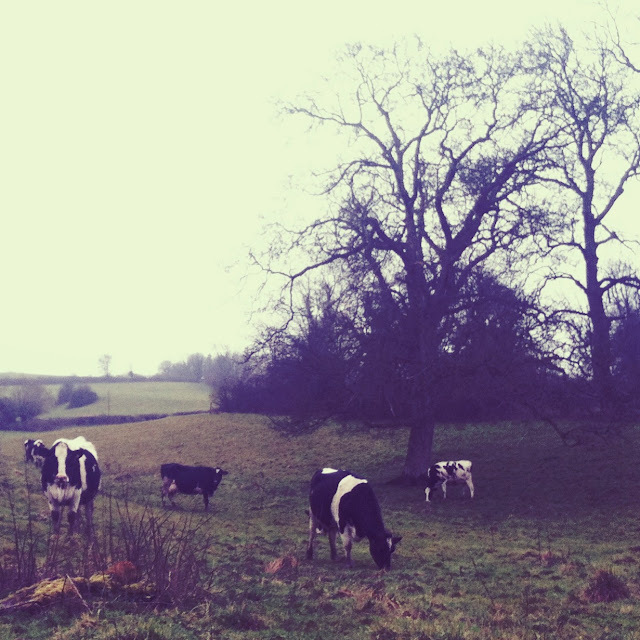 Today it was the giant monochromatic cows grazing in the pastures as we walked right past. It may have rained on us. 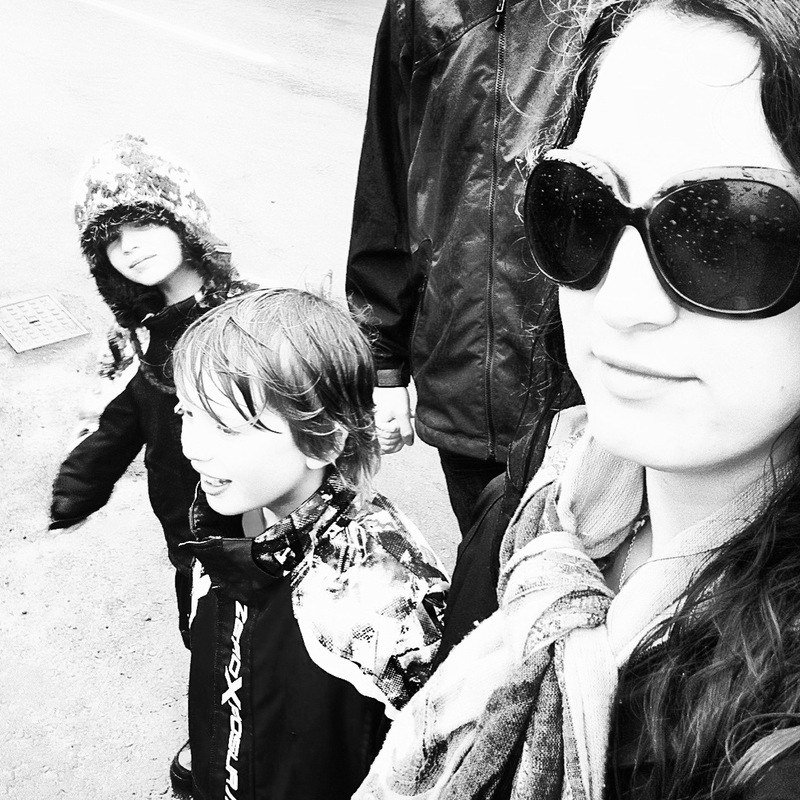 We may have been drenched by the time we got home. It was still a wonderful walk and we came home with smiles on our faces. Hope you all had a lovely weekend with the ones who matter most. Beautiful sunny day awaited us this morning before we headed out on our walk to church. 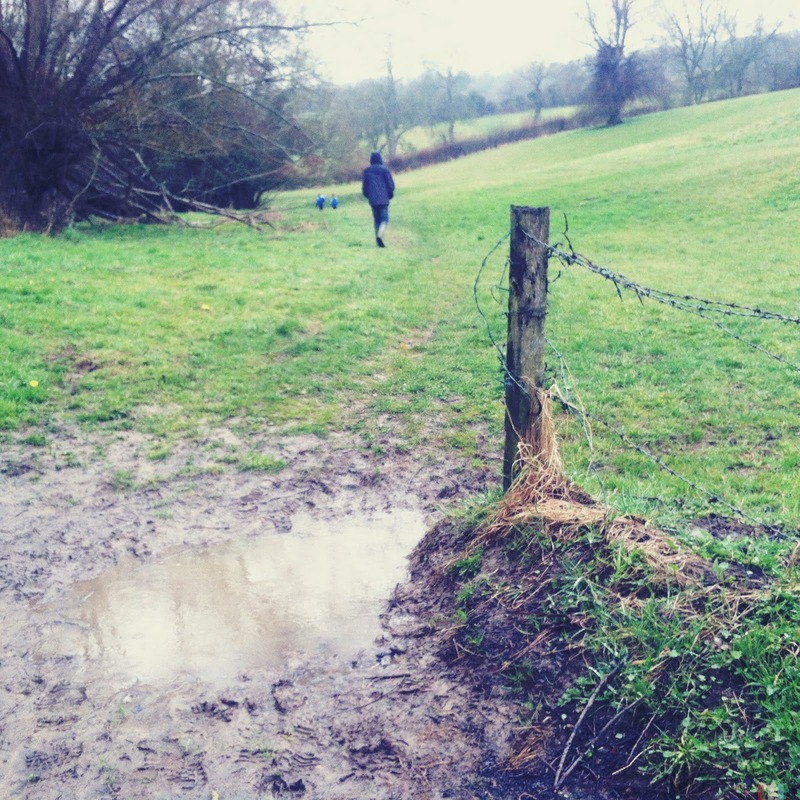 Rain meant mud and puddles. 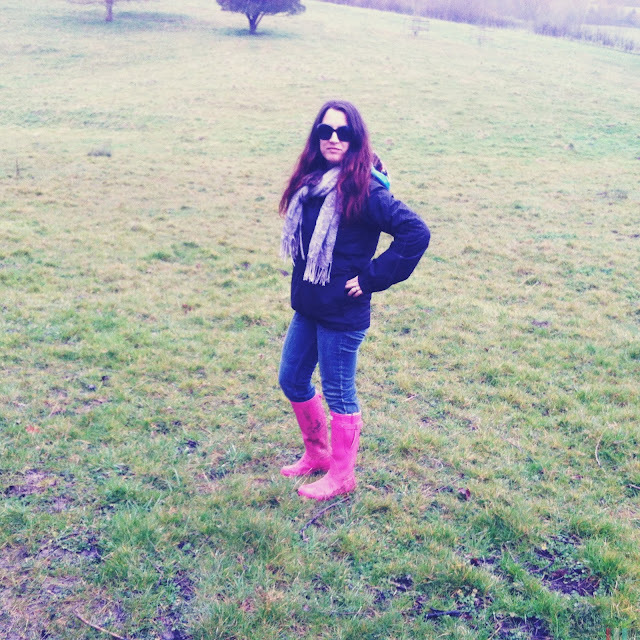 Two things I just love when I am wearing my beloved pink Hunter wellies. 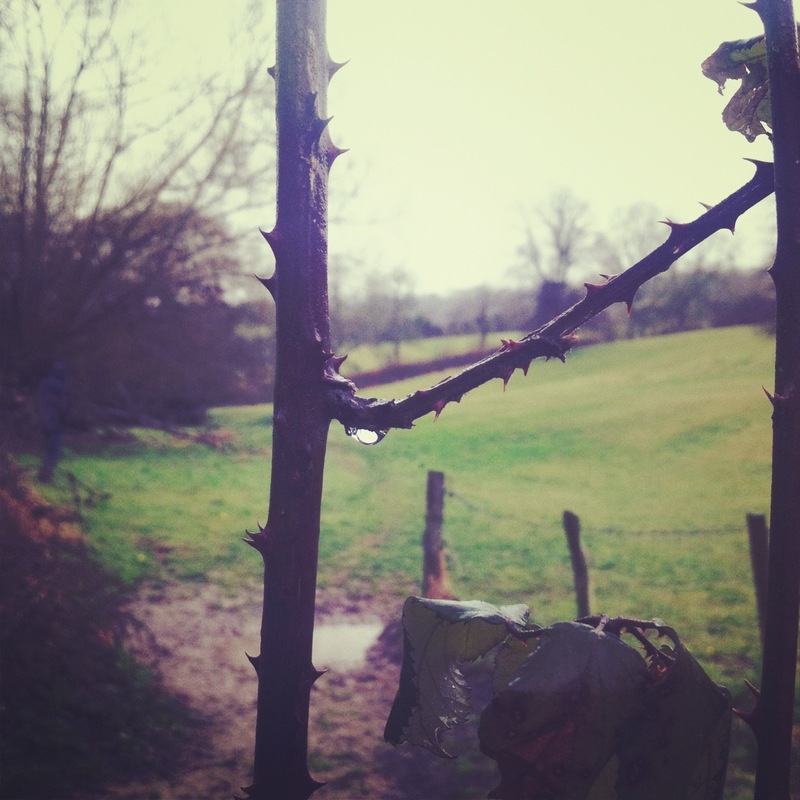 Raindrops falling from the limbs of a thorn encrusted branch. You really can find beauty if you look for it. 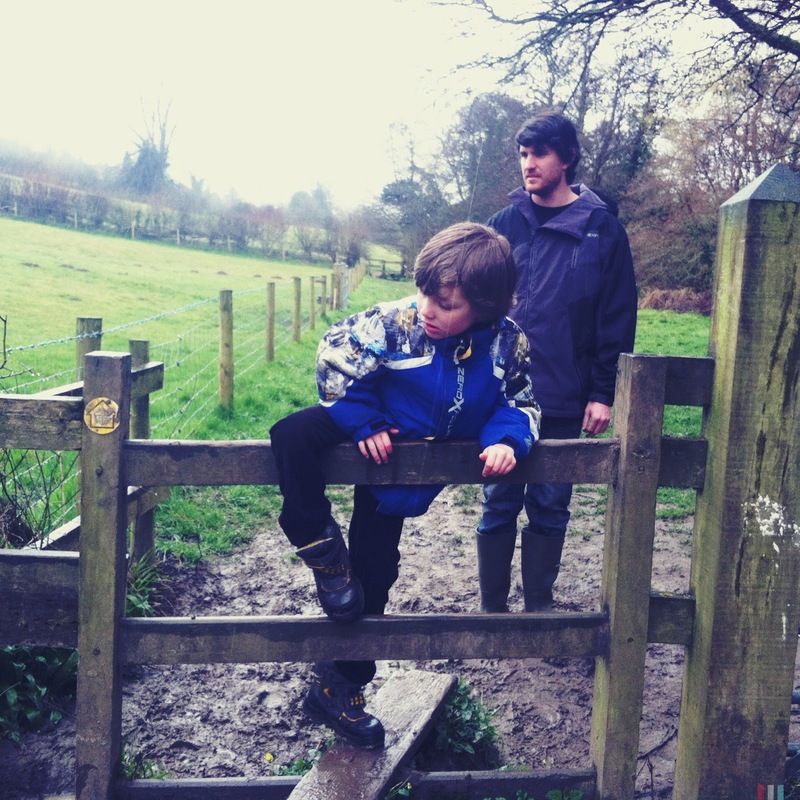 Climbing is always involved on the public footpaths. This is how you climb from one side of the gate to the other. 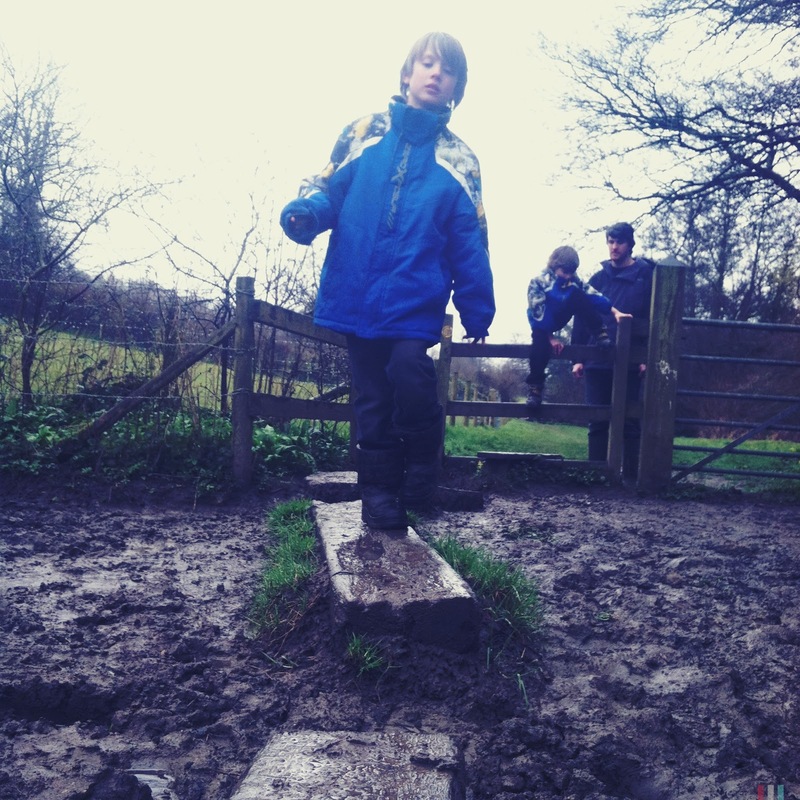 Very slippery mud in this area so we kept to the planks like pirates of the English land. 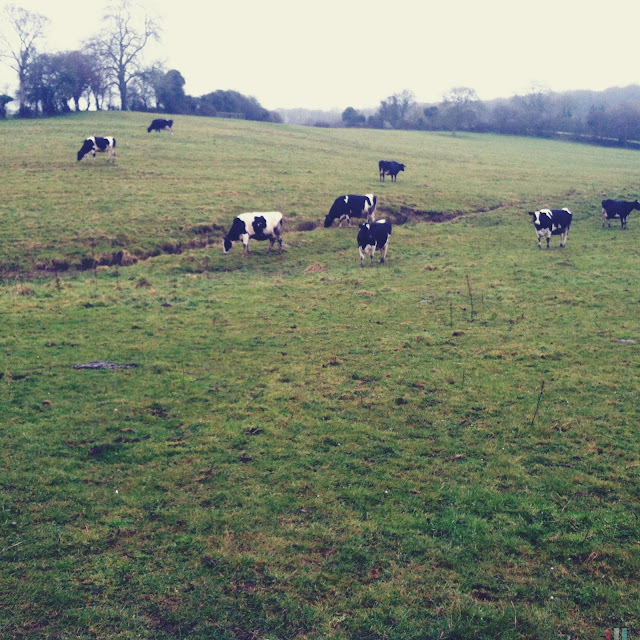 The cows grazing in their fashionable monochromatic trend. We of course had to ‘moo’ and hope the cows would in turn talk with us. The one on the left stopped grazing for a moment so I could partake in a country walk photo op. Follow the yellow arrows and look out for the public foot path signs. Maddox got splattered with mud when I hopped down from the gate. 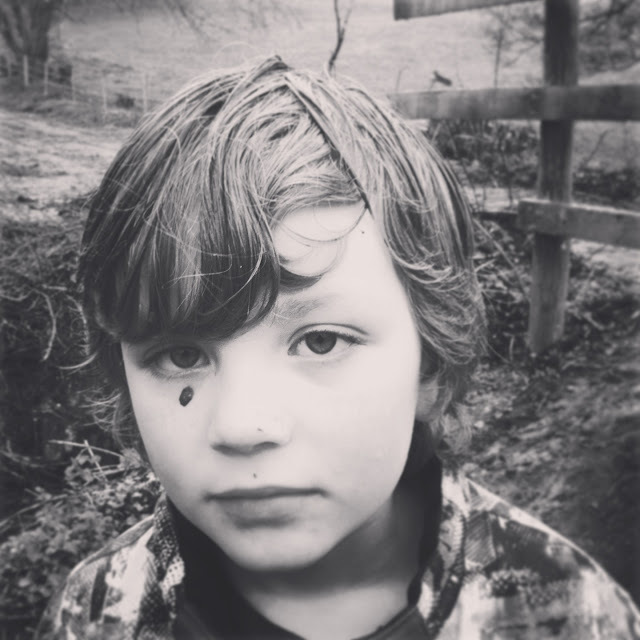 It looked like he cried mud. Not sure why I feel I look grumpy, because I was anything but while we are outside. 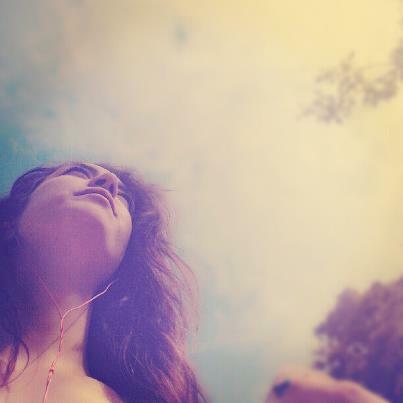 Love being outside. 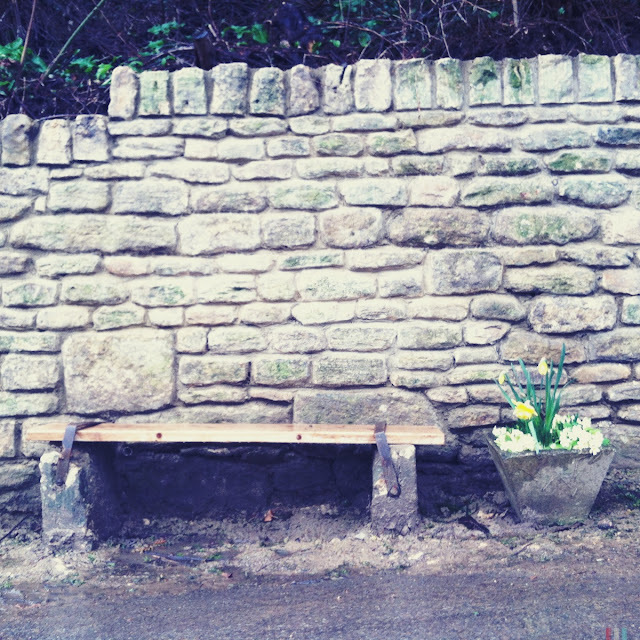 If it was not so wet I would have easily sat down and enjoyed the flowers. 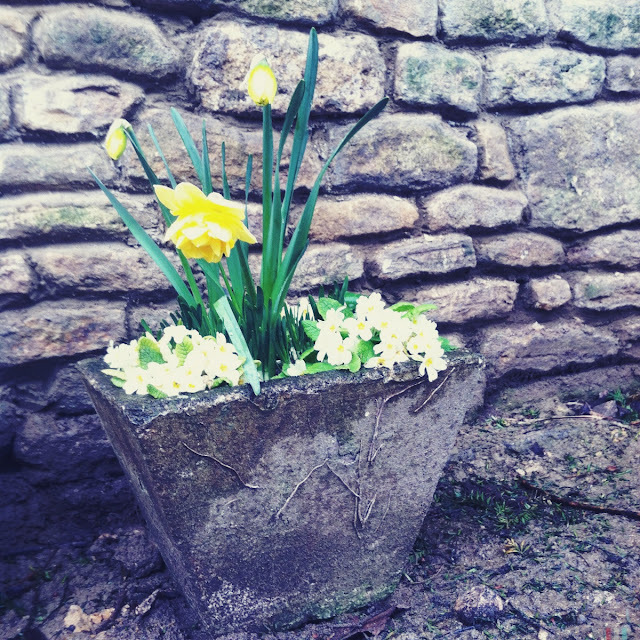 Oh how I love Spring! April Showers bring May flowers right? Trying to keep up with taking more photos of the two of us together this year. Ronan helped out today. We stopped by the shop for milk and it was still raining. However they did not seem phased by the weather. Sometimes I wish I could pause moments in time. This would be one of them. After church today we enjoyed homemade parsnip soup and a few pots of tea. The sun is outside but taking it easy today as we catch up with the laundry from the week. I should really post about how I do laundry in England, because it quite differs from the US. 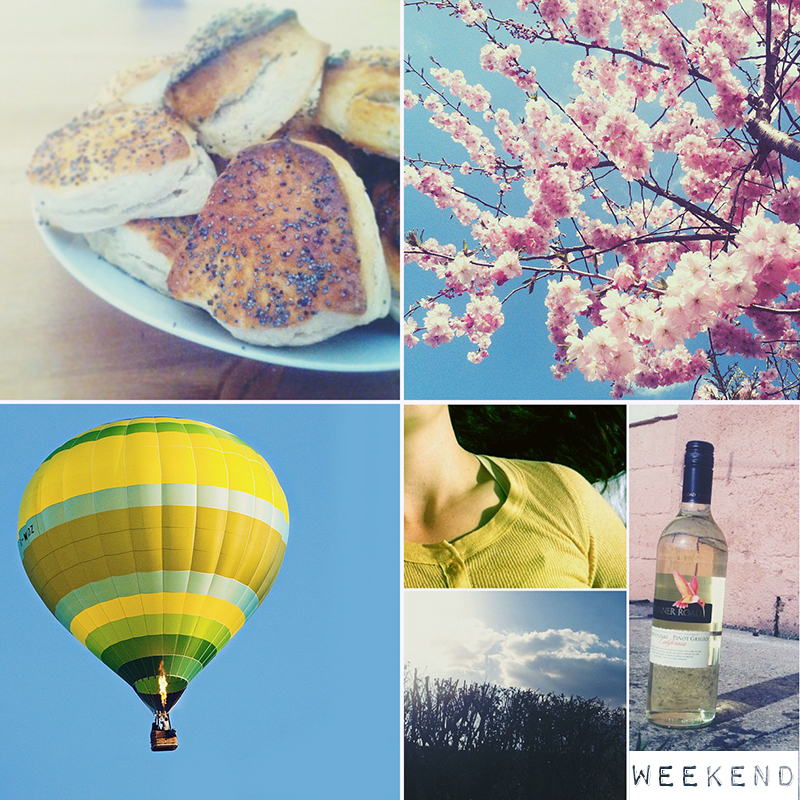 Till then, let me know how your weekend was and what you got up too! If you follow my blog you know that my husband and I love living in England. One of our favourite things to do is go on walks on the weekend. When the weather is really wet sometimes we hide inside. But today it was not only warm, but the sun was out along with the blue skies. You know the amazing view I talk about seeing from our living room window? The beautiful hills dotted with cute white sheep? Well we finally went to the very top of it today. We started at our church and walked up to find it is indeed Solsbury Hill. and of course more sheep. There were even more lamb out today. Arsenal game. 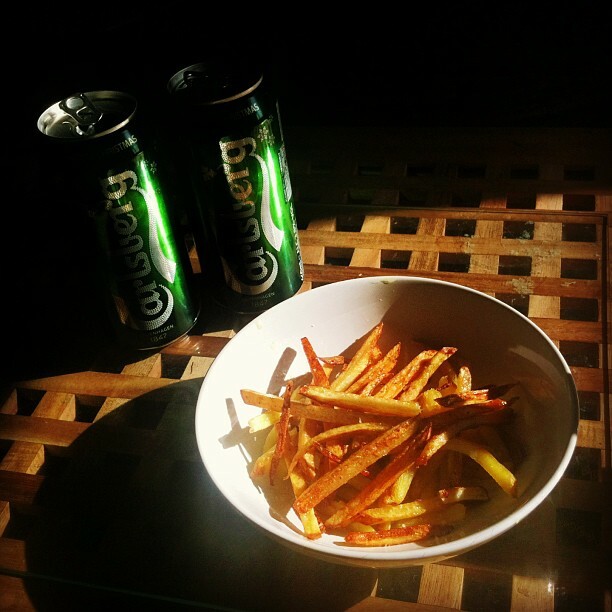 Ryan made homemade chips to accompany our Carlsberg. It has been a great day with the familia. 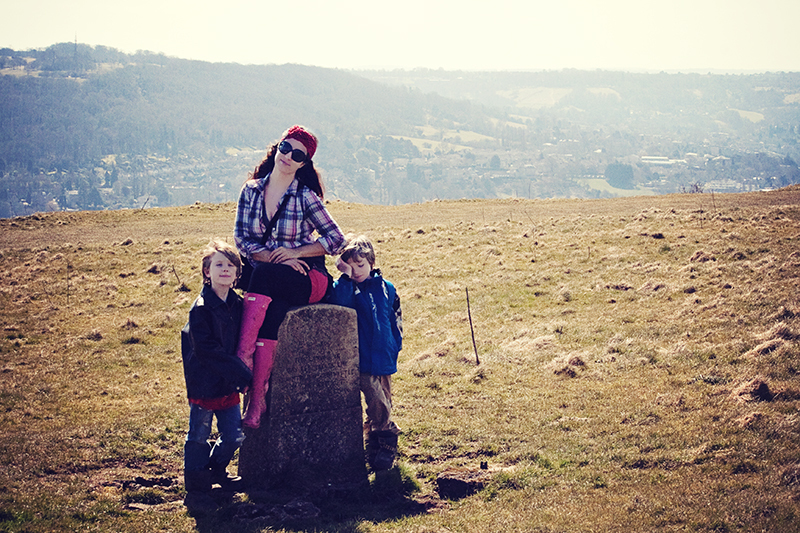 With my boys, Ronan and Maddox, on top of Solsbury Hill in Batheaston. 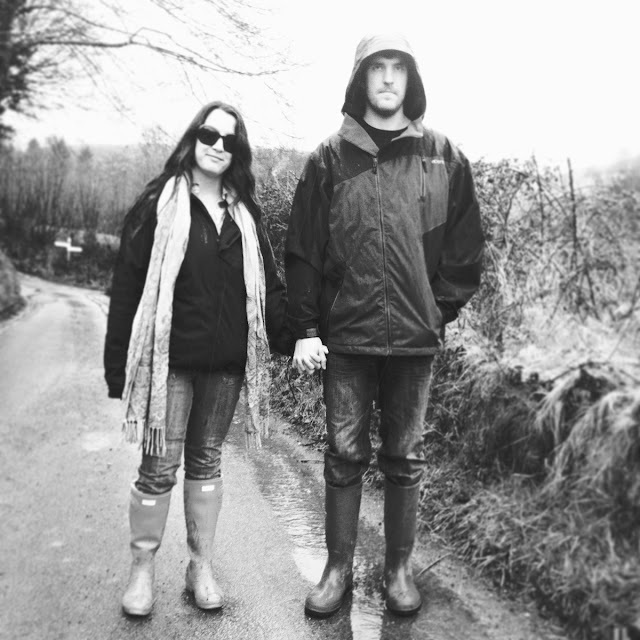 My husband and his wellies, a must have for our country walks. Ryan made homemade chips to eat while we watched some Football. Go Gunners! 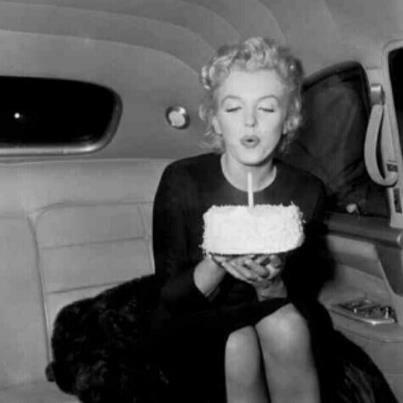 …Today would be Marilyn Monroe’s birthday. A big happy birthday to someone who has left quite an impression and legacy on the world in her short 36 years alive. 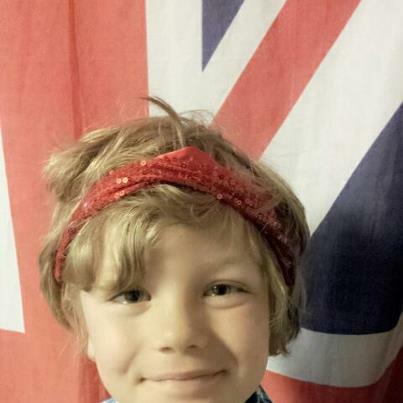 It is Red, white, and blue day at school and yes those sparkle. Day 1 of Live Fashion photography workshop with @LindsayAdler with @creativeLIVE So inspired and motivated! Just saw a vintage belair state patrol car in England.